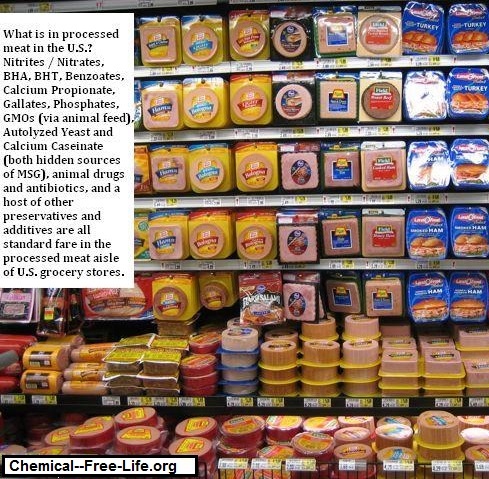 Processed meats in the U.S. contain food additives that have been linked in scientific research to numerous adverse health outcomes, and for some of those chemicals that link includes cancer. Now another study has found a link between consuming processed meats and an increased risk for breast cancer–a 9% increased risk, in fact, suggesting that those consumers who wish to reduce their risk for breast cancer should remove processed meats from their diet. Studies on red and processed meat consumption with breast cancer risk have generated inconsistent results. A new meta-analysis study has now examined all published studies on the topic. Comparing the highest to the lowest category in the 15 studies included in the analysis, processed meat consumption was associated with a 9% higher breast cancer risk. Note: Investigators did not observe a significant association between red (unprocessed) meat intake and risk of breast cancer. Journal Reference: Maryam S. Farvid, Mariana C. Stern, Teresa Norat, Shizuka Sasazuki, Paolo Vineis, Matty P. Weijenberg, Alicja Wolk, Kana Wu, Bernard W. Stewart, Eunyoung Cho. Consumption of red and processed meat and breast cancer incidence: a systematic review and meta-analysis of prospective studies. International Journal of Cancer, 2018.